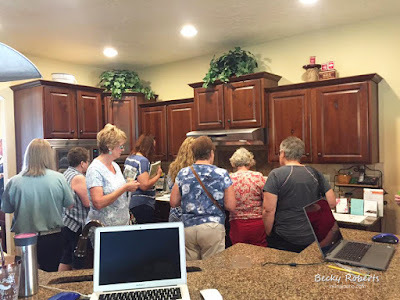 My first Fun Stampers Journey Open House was a success! What a fun and crazy, packed with happy people day it was! I shared the day with 4 of my downline and we all invited our customers to come see the new products, pick up the new catalog and be inspired. Packaging Products - Treat Box 10/$6.95, Journey Advent Box 25/$8.95, Passport Book 10/$5.95 and Note-velope die for the gift card holder (black). My team that participated today, Patty Sowell, Carrie Rhoades, Jen Guarino, Richard Garay on the TV, Sara Sherlock and myself. Happy girls watching Richard's videos. We had them all on a loop and played them on the TV all day. Your open house looks like it was a wonderful adventure for you customer! Thank you for sharing all the exciting products and showing your customers smiles! I look forward this year seeing your great creative ideas with this new product. Congratulations on a wonderful-looking day1 I wish the same as Anita wrote, above! I loved seeing your home filled with such happy folks and energy! Best wishes!